Throughout time, man has employed many ways of documenting the passage of time and recording history so that future generations can understand what came before them and how we evolved to be the civilisation we are today. From spoken accounts, and cave paintings, to ancient manuscripts, our records of time past have allowed us to share valuable information with our descendants. With the advent of photography we have acquired a new way to record our autobiographical memories allowing us to freeze and record events in time and to recall those moments over and over again.In recent years, the development of automatic cameras and smart phones has democratised photography allowing it to become an important way of capturing not only important historical events but every detail of our lives no matter how significant.Parents capture images of their growing offspring almost daily to document the aging process. Similarly, we like to take as many photographs as possible of our older family members before they are no longer with us and those memories become but a hazy recollection of a person who once meant so much to us. The passing of time can be recorded by photography in many ways. A long exposure can be used to capture the effect of time on an image, whereas a short exposure is used to capture an instant of time. High Dynamic Time Range images can capture the passing of time by combining many photos taken over a long period of time, such as a day or even longer. Time lapse and stop motion photography allow us to capture a process that occurs over a period of time and then allows us to speed up that process. The theme of this competition is very open and very broad. It has a lot of scope for creativity. We look forward to seeing your interpretation of ‘As Time Goes By’. Sue is a photographer with 35 years&#039; experience. She has travelled from darkroom to digital (with difficulty) but is now at home with digital imaging. She is a Member of Arena, Landscapes Collective UK (LCUK), known as ‘Luck’, The Devon Guild of Craftsmen and Devon Group ‘Artsix’ – a multidisciplinary Group. Sue sits on the panel assessments at the Royal Photographic Society and is a member of the RPS Distinctions Advisory Board. She is married with a long-suffering husband and two grown up daughters. Sue has exhibited widely both in galleries in the UK and FIAP exhibitions. Her work has been published in many magazines including the Sunday Times, Coast, and the RPS Journal. She had had six images in the Landscape Photographer of the Year Book and three of those images were at the National Theatre Exhibition. She is co-author of the book ‘Coast’ an Arena publication. Sue has become known for her work on tidal sea pools, an ongoing project in the UK and Australia where her elder daughter lives. 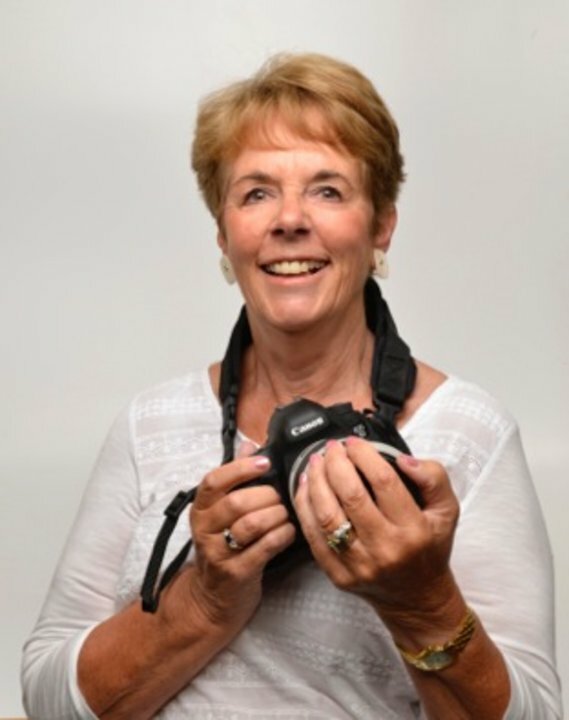 Sue is a regular contributor to The Photographic Angle exhibitions. It was the composition of this image which decided me on first place. The star trails have been well handled but the circles to echo the shapes is what clinched it. Well handled, well seen and not an easy image to take so well. Lovely lighting in this image, well handled by the photographer. I like the fact that the child has been caught in 'flight' and in spite of strong back lighting, we can still see the detail in the face. Good composition, strong straight down the middle - breaking the 'RULES'. Very imaginative image with a lot of work. I liked the graphic detail with the curves. The 3 main elements worked well and asked a lot of questions. An eye catching image. A very colourful, eye-catching and thought-provoking image that fits the set subject well. Good choice of viewpoint. The low key lighting suits this sombre image, some light reflected back from the napkin and just a hint of light to show his chair. A thought provoking image handled well. I enjoyed the lighting on this image and the subtle tones. The light catching the edge of the wing, the air tank and bubbles, and it fits the subject well. A well put together image where a lot of thought has gone into the set subject.